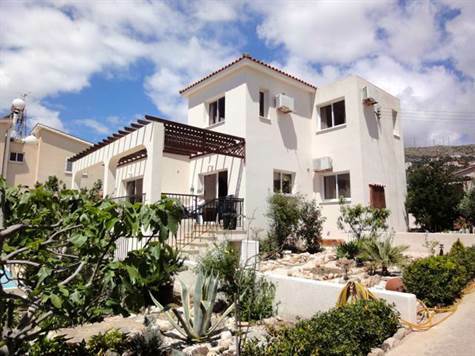 Tala, Paphos - This spacious 4 bedroom detached villa with superb sea views is located in Lofos Tala, one of the most sought after residential neighbourhoods within easy reach of Paphos and the International School. The ground floor features a spacious living room with feature fireplace and patio windows leading on to a wide veranda overlooking the swimming pool terrace. An attractive archway separates the living room from the fully fitted kitchen/diner which has light coloured units, modern appliances and easy access to the outside veranda via patio doors. On the lower floor is a self contained studio with kitchenette, shower room and living/bedroom- ideal as a granny flat, maid's quarters or guest accommodation. Please refer to MLS #:1340 when inquiring.